You can have the most advanced components on the market to improve your accuracy, but if you don’t have a good grip on your Glock, they won’t matter much in the long run. Stippling is a great way to improve your hold and form, so let’s take a look at what it is and how to do it. What Does It Mean To Stipple A Gun? Because the Glock frame is composed of polymer, it is possible to easily alter the surface with common tools like a sanding disk to improve the texture. It’s a pretty simple concept—the flatter and smoother something is, the more likely it is to slip in the hand. A more varied texture with bumps and ridges provides a better grip. 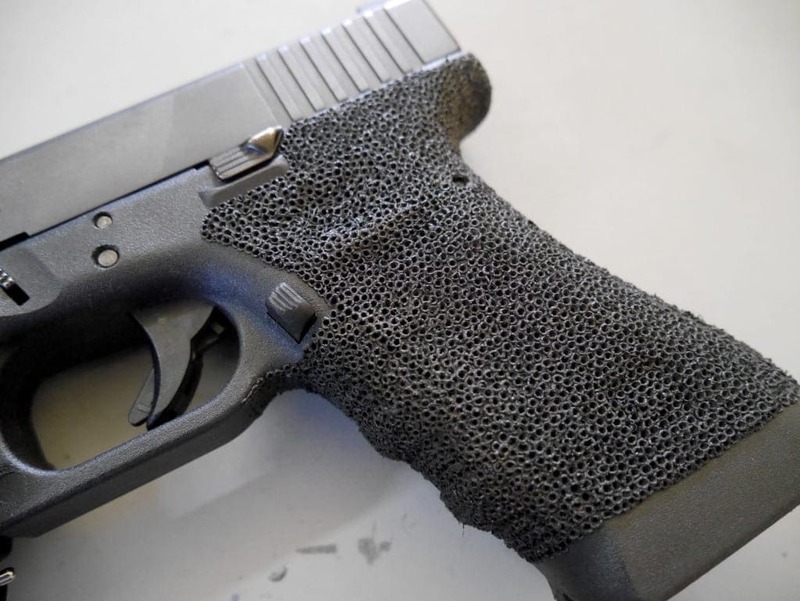 This is the basic premise behind tons of aftermarket grips on the market but stippling a Glock on your own can provide a custom finish that caters to your specific needs. ​This is the most obvious reason but nonetheless the most important. For all the accessories out there designed to improve your shooting, a simple adjustment to the texture of the grip makes a world of difference. ​There are aftermarket grips aplenty but many gun owners who feel a little adventurous can experiment to get the texture and pattern that works best for them. This is especially true for gun owners who find that other grips are too coarse and rough on the hands. ​It’s not every day that there’s such a simple thing a gun owner can do to make a Glock uniquely their own. Too many components and upgrades are incredibly complex. Stippling a gun is an easy task that you can be proud of. ​Grips aren’t expensive, but if you’ve got the tools (or can borrow them), stippling is free! You can probably stipple your Glock with a lot of tools, but in the interest of saving your poor Glock, you should rely on what experts use. These tools are relatively cheap, they’re handy to have anyway, and so, are worth the investment if you’re a fan of DIY-style projects. The Oregon Trail Stippling Kit is specifically designed for gun stippling. You get a Wall Lenk 25-watt wood burner with a short shaft that enables you to work up-close for details and precision, a 20 LPI waffle tip, and a 20 LPI finish tip which is ideal for geometric straight lines. Additionally, there are tips for specific shapes, such as rectangles, circles, and so on. 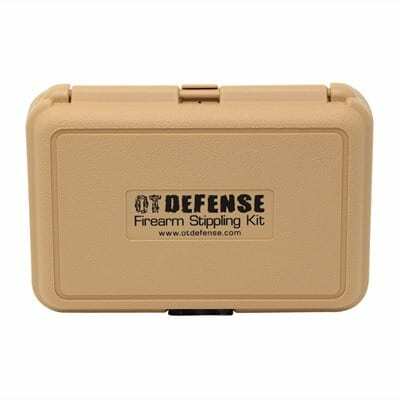 This is ideal for doing a lot of very customized designs and you can practice on the case itself, as it is hard plastic. This is a great set of tools that can be used for stippling any gun’s grip and is a wise investment. If you really want a serious tool for stippling, consider a great Dremel tool. These are excellent for far more than stippling your Glock. High-speed cutters are perfect for hollowing, shaping, slotting, grooving, and creating tapered holes in everything from metal to wood. For stippling your Glock, you’ll have absolute precision over your design, not just in creating the ridges and patterns you want, but smoothing areas that wind up too rough or uneven. 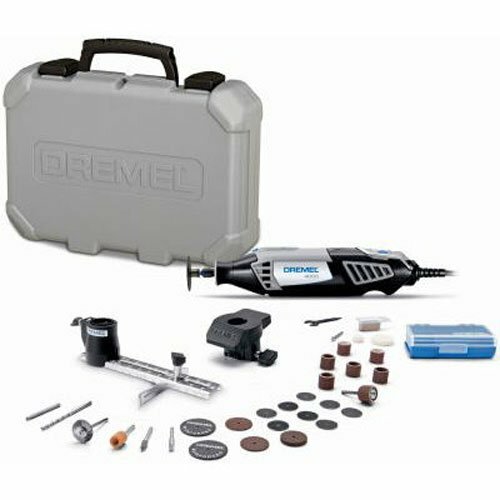 It might be more than you need, but a Dremel tool belongs in every garage, so if you don’t have one, now’s a great opportunity. The answer is yes, you do. You can practice on spare frames, but you can also practice on just about any similar surface. Get used to your tool before you put it to your Glock! ​Before getting to the patterns, you have the opportunity to adjust the shape and base surface. If you have a Dremel tool, start out by removing things that bug you, like finger grooves that don’t fit your hands right. ​Don’t just put random patterns on your Glock. Hold it and observe areas where you could use better texture. You don’t have to be an artist but putting the design to paper will serve as a reference. Before you start, remember: you’ll do just fine, but just in case, have a backup plan in case you don’t like the finished result. Whether that’s a new grip to slip on or another one to stipple, be sure you don’t get stuck with something you don’t like. Now it’s time for the fun part! Refer to our video for a visual and read the following steps to guide you through the process. Your stippling will be uniquely yours but remember that everything you do should be for a reason, and how something looks should follow how it performs. First, consider modifying the shape as outlined above to remove any problem areas like finger grooves. When it’s time to stipple, you’ll want to grab some masking tape and a pencil. Use the pencil to lay out your pattern and use the masking tape to achieve perfectly straight lines. You may also cut the tape to provide borders, just like creating a stencil. Once you’ve applied the tape as you wish, stipple along the edge. With the edge complete, use your wood burning tool to fill in a pattern of your choosing. You’ll want to use adequate precision, so be sure you choose the tip that makes sense for how dense the pattern is. Start from the border and work from there to keep your spacing even. That’s really all there is to it. Filling in will be time-consuming, but it’s 90% of the process. Take breaks if needed to prevent yourself from rushing and creating uneven work. Once you’re done, you may opt to use fine sandpaper to smooth the result, but it’s not required. See how it feels against your hand. Don’t sand too much, though, as it will defeat the purpose—ideally, you’re trying to just improve the comfort a bit. Lastly, you may also apply a spray coating. We think stippling your Glock is a fun way to improve your Glock’s performance and make it uniquely your own. It’s not every day you have such an opportunity. Still, if that’s not your thing, that’s fine, because you can reap the rewards of an improved hold with aftermarket parts in the form of pre-made grips. 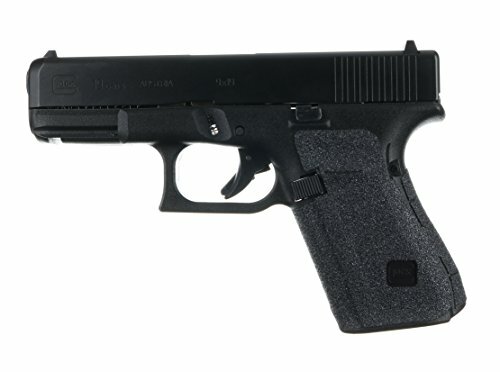 We’ve looked at the best grips for your Glock before separately, but if you want the quick answer, you can’t go wrong with TALON Grips for Glock. They come in rough granulate, as well as a softer rubber texture (granulate provides the best hold but is rough on the hands, and is the only serious option for competitive shooters). TALON Grips perfectly cover everything from the side panels to the thumb rest and backstrap. You’ll get grips for the three finger wraps. Gen 5 users will have coverage going from your trigger guard to the magwell’s bottom. Available for Gens 1-5, as well as models 19, 23, 25, 32, and 38, and in black or moss, they couldn’t be easier. Simply choose your model, your color, and your texture. Stick them on and instantly get a better grip. It’s not a custom job, but it’s easy and effective. If you decide to stipple in the future, the grips are removable. Stippling is a fun way to customize your Glock, but more importantly, it adds great support to your grip and form. It’s easy to do with common tools like a Dremel tool. If you don’t have the tools, they’re a worthwhile investment for many other projects. Use our guide to make your own stippling design or—if it doesn’t sound like fun to you—pick up a solid set of pre-made grips.